Whether you’ve been blogging for years or you are a new blogger I want to help you to improve your blog in 2017. I’ve been blogging for years now but I know that there is still so much that I need to learn and start doing to improve my blog in 2017. I started doing a lot of these things that I’m sharing in 2016 and it really helped. I feel that this past year I have grown a ton as a blogger. I’ve made more money, grown my traffic and wrote a lot of content I’m proud of. I want to help you to be a better blogger as well. I’m still in my journey too and I’ve learned so much from other bloggers who were kind enough to share their wisdom and knowledge. So I want to do what I can to help you improve your blog in 2017 and make you a better blogger. If you really want to see a lot of growth in your blog than Pinterest is a great place to focus on and improve next year. I’ve spent a lot of time on learning what works and doesn’t work for Pinterest. You can check out my FREE course here. This course will walk you through learning the basics of growing your Pinterest as a blogger. One of the best ways to get the most growth with Pinterest is by pinning frequently and consistently. Which is why you should look into getting a Pinterest scheduler. It is the best thing I have done for my blog this past year. This is one of the areas I am going to put more time and energy into during 2017. This past year I have doubled my list of subscribers to just under 1,000 which is an ok start but I know that there is so much benefit to me as a blogger if I can grow my list. Especially when I finally am ready to release my own products in the future. I want to have a larger list to share with. Growing your list takes time and a lot of effort but if you want to improve your blog in 2017 you need to make it a priority. The main benefit of your list is that you own it and you can connect with the people on your list whenever you want. Social media can change all the time and people may not see your stuff but in their inboxes, you have a much better likelihood of being seen. Do you plan out your blog content? You should be! For a long time as a blogger, I didn’t bother using one but for the past year, I have been much better at it. At the end of the month when I’m looking at how I did on my monthly goals and planning my goals for the next month. I will plan out my content for the next month to 6 weeks. I don’t always stick to what I have scheduled, learning to get ahead of content and have stuff scheduled early is a goal of mine for 2017. I end up moving posts around and to the next month if I don’t end up writing them or finishing them. The best part of content planning is that I don’t end up sitting in front of my computer trying to come up with post topics to write about. I already have post ideas planned. This saves me a ton of time. If you want people to notice your posts and click over to read them from social media. You need to make them want to. One of the best ways to do this is to have great images. There is a lot of stuff online. I’m sure your Facebook wall is full and your Pinterest page is jam packed with pins. So how do you stand out? Create better images than your competition. There are lots of ways to create images you could use. Here are a few PicMonkey, photoshop, or my person favorite Canva. I love Canva and use it to create almost all my images. With Canva you can create images for Pinterest, facebook, Instagram your blog and more. Everything is very customizable. You can save your templates to reuse so you can make images that work together. It’s simple to use and there is a free version. Not only are your images super important to getting people to want to open up and read your posts but so are your titles. I look back on my titles from posts my first two years blogging and they are horrible. No wonder I had no one coming to my blog. Between horrible images and bad titles, I was turning them away. I’m not great at coming up with catchy and amazing titles but I’ve improved a lot. Part of that is just thinking it through more. Not just titling my post whatever pops into my head but actually thinking about my readers and finding titles that I’m hoping will attract them. I also love the headline analyzer from CoSchedule, I will link to it below. It’s an amazing free tool that will help you improve your titles so you get more traffic. I’m sure that you’ve heard as a blogger that you need to know your audience and I’m here to tell you that if you want to improve your blog in 2017 that it really is so important. I don’t have a very niched blog. Meaning I don’t only blog about one topic like a fashion blogger or home improvement blogger. This last year I got real clear about who I was writing to. Not all of my readers are going to fit into that one image I’m thinking of and that’s fine. A lot of them do and that’s what matters. Having a clear idea of my reader helps me to write better posts because I can ask myself what that person needs and what posts they are looking for and write those. It keeps me from writing about everything and having a messy and unfocused blog. Creating opt-ins are an excellent way to grow your email list. An opt-in is a freebie you give your reader for signing up for your list. This can be a checklist, a workbook, a free course and more. There are countless ideas. Another name for these is content upgrades because what you are giving them in exchange for their email upgrades the quality of the post they just read in some way. The key is making the opt-in great enough that your reader needs it and wants to sign up. In 2016 I created a lot of opt-ins mostly as a way of finding what my readers like and what they sign up for and don’t sign up for. This lets me know what I should be spending my time creating and what doesn’t work. As a blogger you want people on the internet to find and read your blog and when they do you want them to share it so that their friends can read it and hopefully share it. That is how your blog can get traffic and maybe go viral. So if that is what we want and if you are spending time creating posts and publishing them, I’m assuming that you do. This is such a great way to improve your blog traffic and make your blog better. As you start learning more as a blogger and becoming more comfortable as a writer your posts will be better written and you’ll know so many more ideas about creating images, using SEO and making opt-ins. The posts from the beginning of when you were blogging are not as good I’m sure. So now go back and use all this new knowledge to improve and update them. I try to go back and update older posts one or two times a month. Basically, whenever I think of it or have a post I think would do well. To update the post I will read through it and make sure all the information is still good, add new information and update the images and improve SEO. Then I re-pin it and share it to social media to hopefully get new people to see and read it. As you write more and more content for your blog there will be some of your posts that your audience connects with more than others. New readers probably weren’t around your blog when you published those great posts but you still want them to see them and hopefully share them with their friends. So do what you can to make it easier for these new readers to find your best content. I have a plug-in that puts my popular posts in the sidebar. Then I put two of my best most relevant posts in my sidebar that you can click and go see those posts. I just changed one of the posts that was a Christmas one to the post on how to be a happier, healthier and more positive person. Just in time for the New Year. This step is so important so don’t skip it. As tempting as it is to try to learn everything and try it all at once. It’s not possible. Even the best and most successful bloggers don’t try to do it all. They learn what they are good at and master those things. Then you keep learning and trying new things. As your blog grows and you have more to do and your blog becomes profitable you can begin to delegate tasks and grow your team. I’m not to the team stage yet but I know I am starting to realize that I may want someone to help me with a few things here or there. The day just doesn’t have enough hours for me to learn how to do everything I want to do. It’s very easy to become overwhelmed by social media and trying to do it all. With the countless platforms and more starting all the time trying to do it all is not going to work. I have found it best to really devote my time to one platform and then just auto post my stuff to other platforms with a scheduler. Now that I feel good about Pinterest and don’t need to spend a lot of time maintaining it I am now trying to get good at and master Instagram. Don’t misunderstand me. I’m saying it’s not possible to master everything at once but I’m not saying you should stop trying to learn more about blogging. If you want to improve your blog in 2017 you definitely need to make learning a priority. The online world is always changing and growing so there are so many things to learn. There is a lot of free stuff out there (like my FREE Pinterest course), and also ebooks and paid courses. I love learning and am always getting new books and courses to learn more. I’m kind of obsessed but there is so much out there to learn and I know that when I take what I’ve learned and applied it then I see results. So I want to earn more and hope that you will make the effort to learn new information about blogging this year. 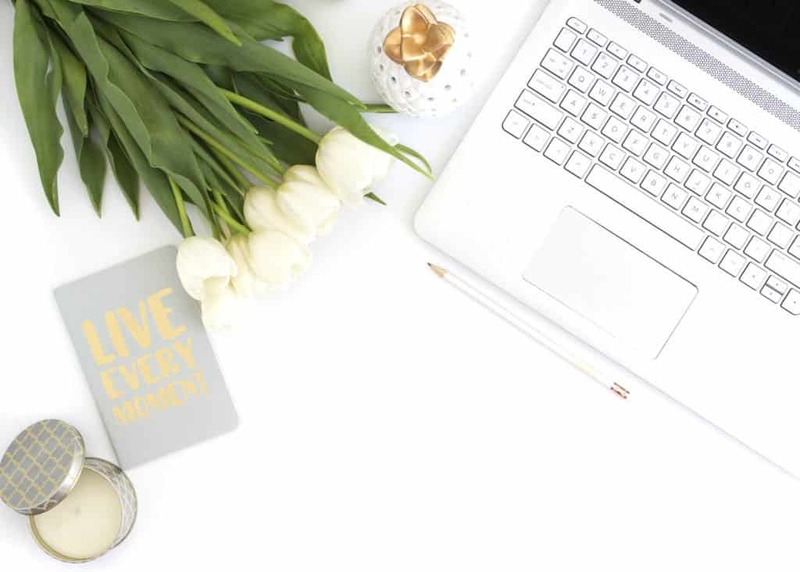 So we’ve talked in this post about how there is so much to do as a blogger and that even when you enjoy it like I do and hope you do too, blogging takes a lot of time. So to improve your blog in 2017 you need to learn how to blog smarter and get things done more efficiently so you can get more done in less time. One way I’ve found to do this is by batching. Which is to focus on doing all of one task in a stretch of time. Such as doing all your photos for upcoming posts all in one afternoon so you don’t have to keep setting up photo shoots. For a great resource on how to batch. Check out this amazing article. I’ve done some batching but I am going to commit to doing it more frequently next year. I know I will see more productivity in my work and it will be a great way to grow my blog in 2017 by getting more accomplished well. The blogging community is wonderful and another way to improve your blog in 2017 is to become a part of it. There are a few bloggers I know better than others and have a relationship/friendship with. I’m also a part of quite a few wonderful Facebook Groups that offer a wonderful community full of help and support. So this year reach out to fellow bloggers, join Facebook Groups and participate in them. Email some of the bloggers you admire and build relationships. 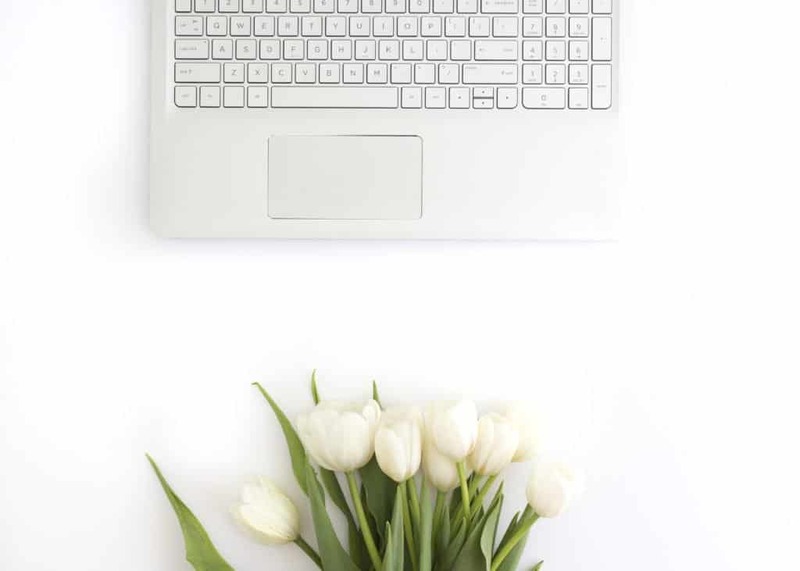 Start off with something as simple as leaving thoughtful comments on other bloggers blog posts. This is a step I really want to work hard on as well. There are lots of blogs and bloggers out there on the internet. Most of them will never have successful blogs and many will give up quickly. You and I can be different, though. We can do the work needed to be successful. That means we need to stand out among all those other blogs. So how do we stand out? That will differ from blog to blog and across different niches. The main factor is that you must step out of the ordinary and be willing to take the risks needed to stand out in the crowd. I understand risks are scary and I’m not great at them. I want to be great though so I’m learning to be better at it. 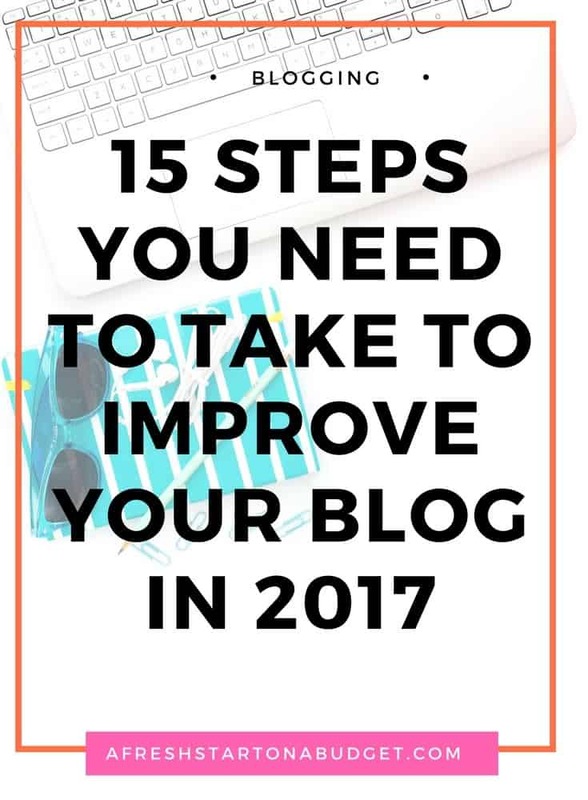 So there you go my 15 steps on how to improve your blog in 2017. I know many of these have worked for me and quite a few I’ve started doing and need to do more of to better my own blog in the next year. I hope that you have great things happen in your blogging year. If you’ve found this post helpful I’d really appreciate if you would share it. These are great tips, thanks for sharing! Thanks for sharing the headline analyzer as well – I had never seen that before but will definitely be using it in the future. These are great tips! I definitely share many of these goals for my blog for 2017. Great post! I have such trouble with planning out my post calendar and creating opt ins. These are two blog items I really need to work on in 2017. Happy new year! Such awesome advice! I know i’m personally working on a few of these right now. It’s crazy for many to understand just how much work goes into being a blogger. Great tips! Pinterest is so useful for getting more views! Yes to all of these! I am already doing quite a few of these but am wanting to implement some of the others this year. This was a really great list with a lot of tips I haven’t seen before! I need to work on repromoting old posts and I am going to take your pinterest course!